Okay, three fielding plays and seven plate appearances isn’t exactly the most complete visual evidence, but it’s a starting point, and there’s quite a bit that can be gleaned from this. First off, Rosario has an athletic 6’2″ frame–his listing of 170 pounds is probably fairly accurate, though he may be closer to 180 at this point. Either way, he has natural athleticism and fluid actions, and he still has plenty of room to fill out and add strength to his frame. He’s not a burner type, as evidenced by his 2-for-5 showing on the basepaths this year, but there are plenty of guys who stick at shortstop without plus straight-line speed–think of Andrelton Simmons, Yunel Escobar, J.J. Hardy, Zack Cozart, Pete Kozma, Troy Tulowitzki, Stephen Drew, Brandon Crawford, or Jhonny Peralta, who all stole single-digit numbers of bases this year but were above-average defensive shortstops per UZR. You can see from the video that Rosario is not without range, and he has a playable arm. Like many young teenage infielders, his biggest defensive issue is a tendency to try to do too much, attempting to make difficult throws on plays that he doesn’t have a shot at the runner. The .941 fielding percentage looks bad, but it’s not out of the ordinary for players at this level–it ranked ninth out of the thirteen Appy shortstops who played at least 20 games at the position, and had he fielded .942 instead of .941, he would have been tied for seventh. Given how much younger Rosario was compared to almost all the other shortstops in the circuit, being at the back of the middle of the pack in error rate isn’t bad. While it’s too early to say that he’ll definitively stick at shortstop–so much of that depends on how his body evolves–it’s safe to say that Rosario will have some defensive value. At worst, he’s probably an average defensive third baseman, which would still give him a slightly positive FanGraphs Defense number. What about the other side of the ball, though? Obviously, projecting to be solid or better with the glove is nice, but Rosario’s going to have to hit a whole lot better than .241/.279/.358 to be much of a contributor. A .295 wOBA doesn’t exactly scream “impact player” regardless of position, especially for fantasy purposes. …and it’s easy to discount the mediocre production. That’s Rosario taking a 91-mph first-pitch moving fastball on the outer half from Clayton Crum and driving it out of the ballpark to the opposite field. You don’t see players do that much even in Low-A, let alone at the Rookie level, and it’s especially intriguing to see such a display from a player so young and who isn’t just a big power masher type. Watch how long Rosario waits before he starts his swing. He has very impressive bat speed, and thus can sit back on pitches for much of their flight path and still get his bat to the ball. They say “you can’t walk off the island,” and Rosario’s 4.9% walk rate might paint him as an adherent to this dogma, but his approach actually seems fairly patient–he offers at just nine of the 23 pitches in the video. He also struck out just 19% of the time, a testament to his advanced ability to make contact. His .118 ISO isn’t too bad for a shortstop, and power could become a significant element of his game as he continues to settle into pro ball and refine and develop his swing, approach, and skillset. It seems that most of Rosario’s contact to the left side is on the ground, whereas his line drives and fly balls come to center and right. 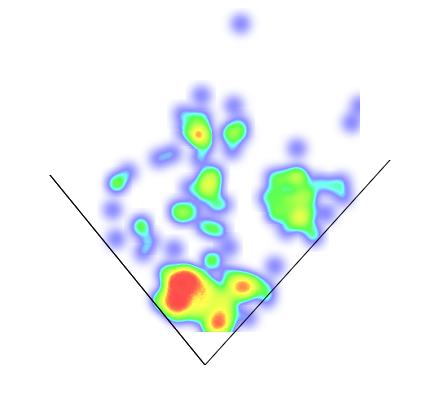 Per his spray chart, just one of his fifteen extra-base hits went to left field, with nine to center and five to right. Just three of his 34 flyouts were caught by left fielders, as well. In the home run clip, Rosario stays very stable and upright, allowing his hands to rip through the hitting zone and sting the ball. Here, his right shoulder is dipping down all the way through the swing, giving him less explosion through the ball and looping underneath it. It’s obviously very tough to do anything with inside pitches from this position, and when Rosario dips his shoulder like this, he’s cutting off a lot of the advantages that his quick hands give him. Thankfully, this is very fixable, and Rosario has years to fix it. If he can be more consistent in his posture and cut out the shoulder movement, his bat speed should play more consistently and make him above-average in both contact and power. This is a well-located two-strike offering, and Rosario again fails to stay consistent with his mechanics, stepping slightly in the bucket and relying on that shoulder drop to get his bat to the outside corner. He doesn’t use his lower half much here, throwing him out of whack and causing his back foot to fly up after the swing. In sum, Rosario is a player who already shows a diverse skillset. He has bat speed to burn, and his size and strength give him the potential to provide above-average power for a middle infielder. He’s also fairly polished for a 17-year-old, as evidenced by his ability to demonstrate his tools against much older competition in 2013. On the flip side, there’s a lot for him to work on, but it’s all just a matter of slowing the game down, refining, and gaining consistency rather than innate athletic deficiencies, and he has a lot of time to smooth out those rough edges, to say the least. He has a long way to go, but his ranking as one of the top short-season prospects is well-deserved, and I expect his raw statistics to improve in 2014 with a year of adjustments and reps under his belt. Rosario should already be a target for deep-league dynasty owners looking to jump on the best of the newest crop of international prospect, and he’s still a player to track for those in shallower prospect formats, as he’s a definite 2014 breakout candidate. We hoped you liked reading Amed Rosario: Teenage Breakout Candidate by Nathaniel Stoltz!